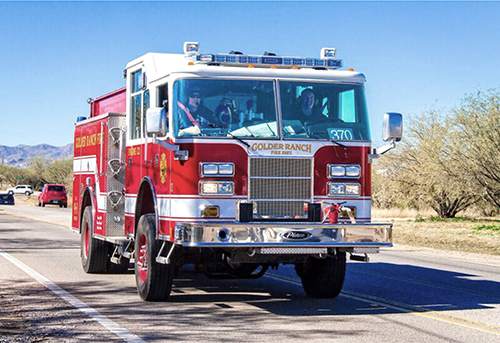 The members of Golder Ranch Fleet Services proudly maintain the vehicles used by firefighters, paramedics, and administrative staff with a high level of professionalism and care. All mechanics and techs maintain the appropriate ASE (Automotive Service Excellence) and EVT (Emergency Vehicle Technician) certifications, and hold several specialty qualifications which make them highly trained and competent on in their respective fields. Fleet Services also has the responsibility to professionally recommend and furnish functional and reliable vehicles while remaining fiscally responsible. Facilities Maintenance at Golder Ranch maintains several buildings and campus grounds throughout the District. It supports preventative maintenance programs and organizes repairs as needed on HVAC, electrical, plumbing, mechanical, and structural systems. Facilities Maintenance also identifies areas of opportunity to employ changes to existing infrastructure to reduce cost and increase efficiency.